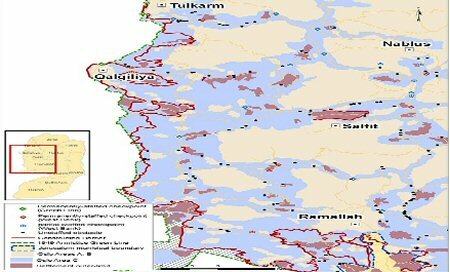 In July of 2018, the United Nations Office for the Coordination of Humanitarian Affairs (OCHA) completed a comprehensive ‘closure survey’ that recorded 705 permanent obstacles, across the West Bank, that are restricting or controlling Palestinian vehicular, and in some cases pedestrian, movement. This figure is three per cent higher than that of December 2016, the date of the previous survey. These obstacles are deployed by Israeli forces citing ‘security concerns’. The deployment of obstacles has become more flexible and, combined with the relatively low level of violence since the completion of the previous survey, has a less disruptive impact on the daily life of Palestinians travelling between Palestinian localities (excluding East Jerusalem and the H2 area of Hebron city) than previously. All the 140 checkpoints include permanent infrastructure but only 64 of them are permanently staffed with security forces, including 32 located along the Barrier or on roads leading to Israel, 20 in the Israeli-controlled area of Hebron city (H2), and the other 12 elsewhere in the West Bank. Al Ray further reports that the other 76 (partial) checkpoints are either occasionally staffed or have security personnel located in a tower rather than on the ground. Excluded from these figures are eight checkpoints located on the Green (1949 Armistice) Line.